UC Berkeley’s Assistant Vice Chancellor has claimed that the university was told by the Berkeley Patriot student group that the upcoming Free Speech Week has been canceled. In an email to Breitbart News, Dan Mogulof, the Assitant Vice Chancellor of UC Berkeley, has claimed that the university was informed by the Berkeley Patriot student organization that the upcoming Free Speech Week, set to take place next week, has been canceled. Mogulof said that the Berkeley Patriot group told the university that all upcoming scheduled events have been canceled and that the announcement was “unfortunate” as the university had spent significant sums of money attempting to prepare the campus for the upcoming events. Over the course of the last eight weeks campus staff have dedicated a disproportionate amount of time facilitating the planning efforts of the student organization. The student organization made preliminary reservations for a number of indoor and outdoor venues. The student organization was provided with contracts for the rental of two large indoor venues week ago, in mid August. They missed three deadlines to complete those contracts and confirm the reservations. The student organization did have a confirmed reservation for one indoor venue, Anna Head Hall, which they voluntarily chose to cancel Tuesday of this week. An entity called MILO Inc. released rosters of speakers whose names never appeared on any confirmed list provided by the student organization. 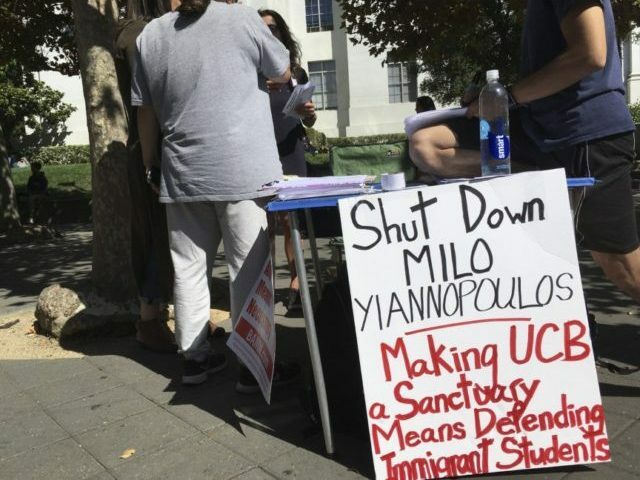 MILO then posted a letter sent from the Berkeley Patriot group to UC Berkeley which states that the event is being canceled due to “threats” made by the UC Berkeley administration and their employees to members of the Berkeley Patriot group.